Scuttle: A Little Bit of Fashion & Alot of Sparkle: Statement. 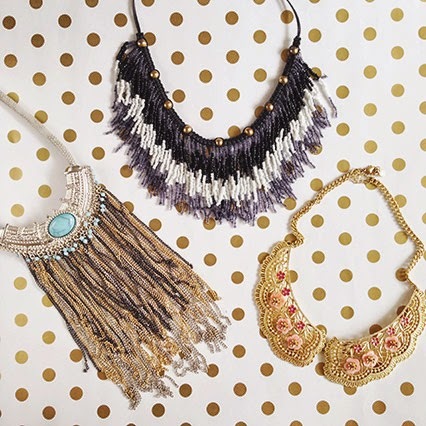 Lets talk about statement necklaces shall we? I talk with so many people who are afraid to wear them. They say either they are "to much" for them to wear or that they don't have anything to wear a statement necklace with. Here is the beauty of a statement necklace... you throw it over basics & call it a day! There isn't a science to wearing them. Simply pick out your your favorite tshirt or sweater, throw a statement necklace on & your good to go. They have the ability to take a basic outfit such as jeans & a white v-neck tee & turn it into something exciting when you just add a necklace.